Our long road home passed through Sedona, where we and our dogs rested for a day before facing the second day of travel, a grueling 13 hour drive to our final destination. 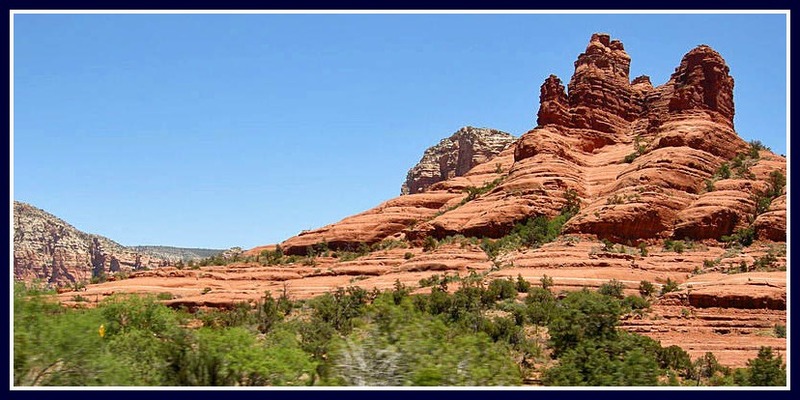 We’ve been to Sedona a few times before so we know what a fantastic place it is, surrounded by awe-inspiring red-rock canyons that create a mystical atmosphere all their own. It’s hot in the summer, but the altitude tempers the dry heat and a cool breeze blows after sunset. Sedona is a hip town, with art, healing vortexes , great food, and lots of outdoorsy, hippie folks. Wherever you look you’ll see bronze suntans and beautiful legs, from lots of mountain hiking. We were re-energized the moment we completed the winding descent from Flagstaff to Sedona. It’s not a drive for the faint of heart, but it’s worth every mile… so beautiful! How could we not feel re-energized in such a setting? Actually, we had to sedate Oscar for the trip, the poor thing goes into a complete panic in the car. Chief, the Jack Russel, travels well. I crave Sedona. There’s nothing like it! I love your picture – and the shooting star story. It’s so fitting for Sedona! Welcome home! I’m glad the trip went smoothly and I’m looking forward to recipes from your full-size kitchen!!! Thanks! Will be posting a bread recipe soon…. no better way to start things going! Shooting stars in big skies, ancient landscape ; sounds like you strayed into a dream on your long journey home. how lovely!. Indeed! It was magical, so unexpected! Sedona is one of our favorite places in the country! Everywhere you look there’s wonderful views. The vibe is so relaxed and inviting and we never had a bad meal in the week that we enjoyed there. And that drive towards Flagstaff is at times harrowing, but simple beautiful! Glad your trip is over and I’m sure your looking forward to be resettled @home! I hope you thought to make a wish on that falling star. Sounds like a nice trip…I will have to visit Sedona one day! You should definitely go there, it’s one of our favorite places, so much to see! So glad to know you made it safely home! Long trips can be difficult, and with two dogs, I think I would be freaking out for weeks in advance! Loved reading about your travels and The Sedona Shooting Star – isn’t it funny how those moments sneak up on us when we least expect them… magic. I hope the dogs are settling and starting to sense home. I have to get myself to Sedona! (beautiful photograph). The dogs are adapting well, Oscar was a bit terrified during the hail storm we had last night, the noise of the hail hitting the skylight in the ceiling was enough to put him on edge. So glad you are home!! Home really is where the heart is. I love that drive from Flag to Sedona. We’re going up to Flag for an art show in August. It’s perfect up there in August!